BOURNE, Mass. - Typically a defensive-minded team, the Tigers offense roared Tuesday night. The No. 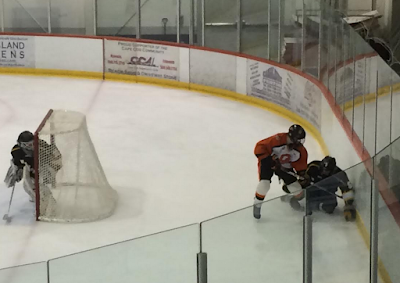 8 Oliver Ames boys’ hockey team (14-6-1) played tough defense, per usual, but their attack prevailed over the No. 9 Nauset Warriors (13-7-2) in a 5-2 win in the first round of the MIAA Division 2 South playoffs at Gallo Ice Arena. Up 2-1 to start the second period, the Tigers refused to let go of the momentum they established in the first. They forechecked well and on defense, keeping the Warriors pinned to the outside, and preventing clean shots on net. "We knew they wanted to use their points, so we emphasized blocking shots at practice all week," Tigers first-year head coach Sean Bertoni said. "We did a good job with all our layers defensively." This dedication to defense created plenty of opportunities for the Tigers on the other end of the ice. Nearly three minutes into the second period, the Tigers doubled their lead when senior defenseman Jack Mahoney had a strong wrist shot from near the blue line. Sophomore forwards Brett Williams and Blake Gallagher had the assists on the play. About 50 seconds later, the Tigers struck again. This time, they capitalized on a Warriors miscue in transition to regain possession. It led to a Tigers odd-man rush and, despite their skaters fighting for balance, they managed to score. Junior forward Eric LeBlanc put it into the back of the net thanks to a quick left-to-right pass from Williams. Sophomore Collin Bourne had the secondary assist. As the second period wore on, the Tigers continued dominating play. But with 3:25 remaining, the Warriors put themselves back in the game... for a short time. Up against the left board, senior defenseman Nick Hull broke past the Tigers defense and put one in for the Warriors, assisted by senior forward Devin Roderick. It would not take the Tigers long to respond, however. About two minutes later, Bourne found himself caught up in a scrum of Warriors defenders just in front of the net. Instinctively, he pushed the puck out to sophomore defenseman Matthew McCormack who flicked it in, giving the Tigers a 5-2 lead. "We're not the most skilled team, so we like those goals where you take the goalie's eyes off the point," Bertoni said. "We love those garbage goals and we had a couple of them today." In the first period, Williams and Gallagher also had goals for the Tigers. Williams’ goal came two-and-a-half minutes into the game while Gallagher’s came with five minutes left in the period. Roderick had the Warriors’ other goal. He beat a Tigers defender one-on-one when he faked left and shot right to tie the game at one apiece with 6:32 remaining in the first. Headed into the contest, Warriors goaltender Chase Holm, a sophomore, had allowed just 1.56 goals per contest. The Tigers are just the third team all season to put up five goals on the Warriors. Although the Warriors did not win a playoff game this season, they are moving in a positive direction. In the previous four seasons combined, Nauset won a mere 14 games. Tiger senior goaltender Zach Walsh allowed 1.89 goals per game during the regular season, and doesn't appear fazed by the tournament lights. Bertoni also noted his team received strong play from junior forward Rory Madden throughout the game. Madden had an assist on Gallagher's first period goal. With the win, the Tigers move onto the quarterfinals where they will face the winner of the No. 1 Scituate/No. 16 Dedham game. That quarterfinal game will be played Saturday, March 4th, at 12:30 p.m. at Gallo Ice Arena.